David is originally from the UK where he graduated with a degree in International Politics. However after embarking on an 18 month round the world trip he decided travel was the journey he wanted to pursue. He now has over 30 years travel experience and has owned and managed the agency since 1993. David is also a member of the Helloworld National Associate Council and acts as the Queensland representative. David thrives on planning extensive and complex travel itineraries for his clients- his customers know they are getting a travel researcher and expert as their agent and advisor. Jennifer’s love of the travel lifestyle began 25 years ago after 3 years of working and travelling London and Europe. She lived and worked in London for a Travel Club that gave her the opportunity to travel Europe extensively. On return to Australia she worked in the Theme parks in a Public relations/Sales role. Jennifer has now worked in the travel industry the past 12 years helping David manage their business Travel on Capri. 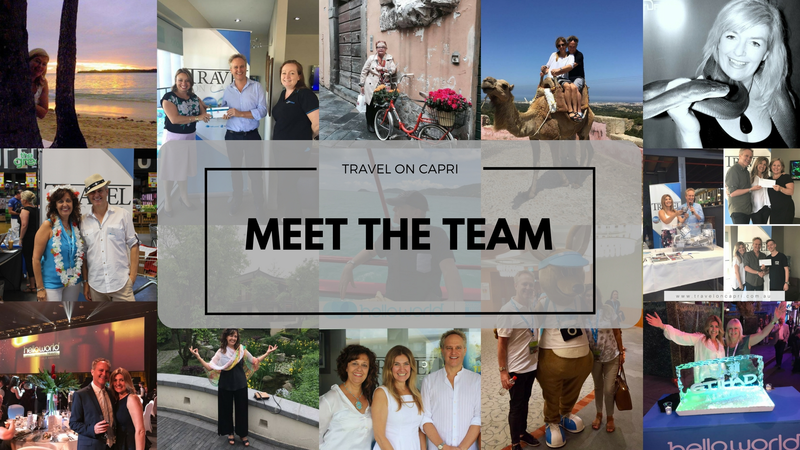 Originally from Argentina, Marisa is part of the Travel Advisory team at Travel on Capri, and her love and experience of travel is evident in her vast knowledge and attention to detail. "There are so many wonderful experiences I share daily with my valued clients, from my "zorbing" in New Zealand, to salsa dancing in Havana. Testing my taste buds in Bangkok, wine making in Sonoma Valley; wearing out my shoes in so many countries in Europe! My motto is to listen, plan and create the most memorable journey - one you can share with all your loved ones again and again, and the reason you will keep coming back for more." Melbourne-born Gayle’s love of people, food and wine lead her to pursue her dreams of becoming a Travel Consultant. Gayle has lived in Italy and the UK, and has a strong affection for Europe. She has been fortunate to explore many destinations in Asia, America, Canada and the Pacific. Gayle is very happy to be a part of the Travel on Capri team, and is already planning some wonderful trips for clients next year. Murf has been working in the travel industry since 1970. With a wide range of knowledge of many destinations, she goes the extra mile in ensuring clients receive their dream escapes. Her favourite destination is Europe because of the charm and romance. She enjoys Gourmet Eating, and walking her gorgeous rottie, Ollie. Murf's bubbly character and love for life makes her an invaluable member of the Travel on Capri team.